AMES, Iowa – It’s not a DeLorean, but a new virtual reality simulation designed at Iowa State University will allow Iowans to drive into the future to see the I-74 Mississippi River Bridge as it will look when it’s completed. The I-74 Mississippi River Bridge Virtual Reality Experience arose from a partnership between the Iowa Department of Transportation, the ISU Virtual Reality Applications Center and the ISU Institute for Transportation. The immersive simulation uses either a headset or computer screen to allow users to experience the completed I-74 Mississippi River Bridge, currently under construction between Davenport, Iowa, and Moline, Illinois. Plans call for completion of the bridge in 2021, but virtual reality shows motorists what it will be like to drive across the bridge, alongside the current bridge. The simulation, which will be made available to the public this year, also includes an educational component in which users dive into the waters of the Mississippi River to learn about the federally protected mussels that live there. Users also can “walk” along the multi-use path of the new bridge or stand on top its arch to get a bird’s-eye view of the interstate below. Nir Keren, an associate professor of agricultural and biosystems engineering who oversaw the simulation’s design, said the system brings into focus the end result of a massive multi-year construction project. The simulation depicts both the new bridge and the current bridge, allowing users to compare the scale and usability of the two structures. Users can drive as motorists from one end of the new bridge to the other, complete with virtual traffic to enhance the user’s sense of immersion. Users can switch through various modes, viewing the bridges from practically any vantage point. 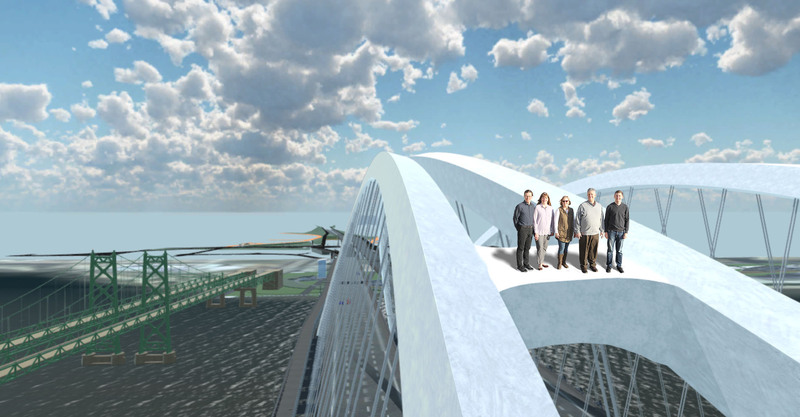 This illustration shows ISU and Iowa Department of Transportation Personnel “standing” on the completed I-74 Mississippi River Bridge as it’s depicted in the ISU-designed virtual reality simulation. Image courtesy of Nir Keren. Larger image. The simulation even takes users beneath the surface of the water to raise awareness of the wildlife that calls the Mississippi River home, including threatened mussel species that had to be carefully relocated before construction could proceed. Keren said four team members attached to the Virtual Reality Applications Center took roughly six months to design the simulation. He said translating the construction diagrams of the new bridge into an interactive model posed some new challenges for the designers to overcome. They focused on seemingly minute details such as accurately capturing the way the construction materials reflect sunlight. The virtual reality program will be available at the Moline Public Library from mid-February through May. Future locations for the simulation will be listed at i74riverbridge.com. It’s a drive through the future, but – unlike Marty McFly and Doc Brown – you don’t have to hit 88 miles per hour to see the completed I-74 Mississippi River Bridge. ISU personnel have designed a virtual reality simulation of the I-74 Mississippi River Bridge, currently under construction between Davenport and Moline. The simulation allows users to find out what it will be like to drive across the completed bridge, scheduled to be finished in 2021.